I had scabies about six months ago and I tried the prescribed cream that the doctor told me to use and found that after several weeks I was not seeing any real improvement. 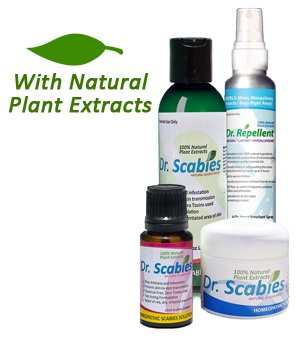 I started looking at websites and found Dr. Scabies that might just do the trick. I bought it and followed directions. I rubbed in everywhere I had spots and not only did it take care of the itching but within two weeks it was starting to clear up. I hope this is helpful. – Phil D.
I've purchased every month for the past 2 months. This is my 3rd. It's the only cream that helps me with mite infection. – Barbara K.
In this modern era off "on-line" shopping and thus, pure faith alone, of product effectiveness. I'm often reluctant to believe commercial and marketing claims of product performance guarantees. I am more than pleased to report Dr. Scabies has performed to and exceeded all claims made in its advertisement.I will be sure to order this wonderful scabies treatment from now on. Thank you for relieving my "terrible" itching, almost over night, great formula. 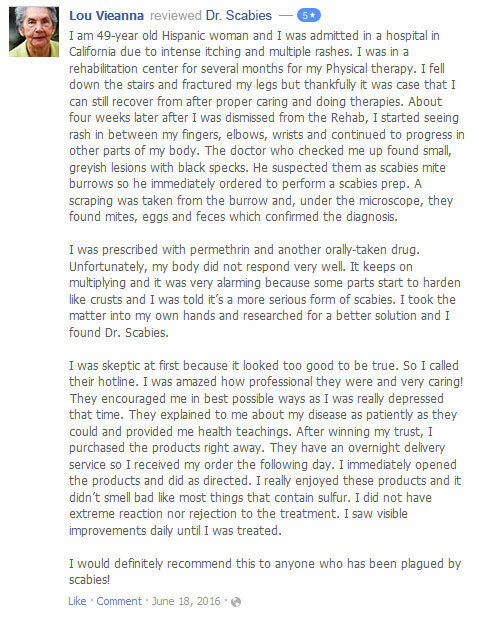 – Kimmy G.
Thank you Dr. Scabies for coming up with this amazing product. It helped me greatly. 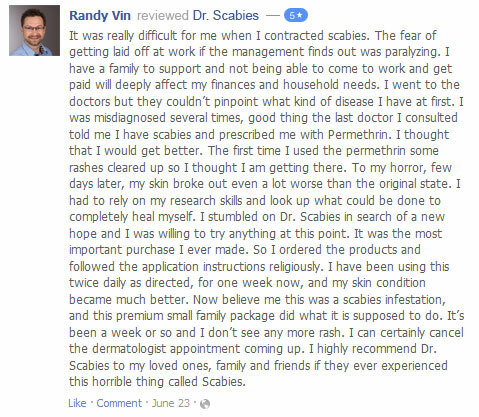 I got rid of scabies with Dr. Scabies. Its one sure short product to burn them out and it worked wonders on me. Good luck and keep up! I am a 62-year old grandfather and I live with my daughter and her 7-year old son. It was last year when I was first diagnosed with scabies. smarter in dealing with scabies. I work in a Nursing Home and scabies breakout among bed-ridden geriatric patients is quite common. Our unit is understaffed most of the time so it is difficult for the nurses on-duty to give thorough care for a single patient. The patients who usually acquire scabies are those who can barely move, speak and immunocompromised. Their attending doctors usually gives them combination dose of permethrin and ivermectin. One time, it was my turn to administer the oral and topical medications for them, one of the patients suddenly had an emotional outburst, he started acting violently towards other patients so I had to hold him down and pacify him. Later that day, I found out that he contracted scabies from one of the bed-ridden patients and during the incident I had a skin-to-skin contact with the patient and his beddings. 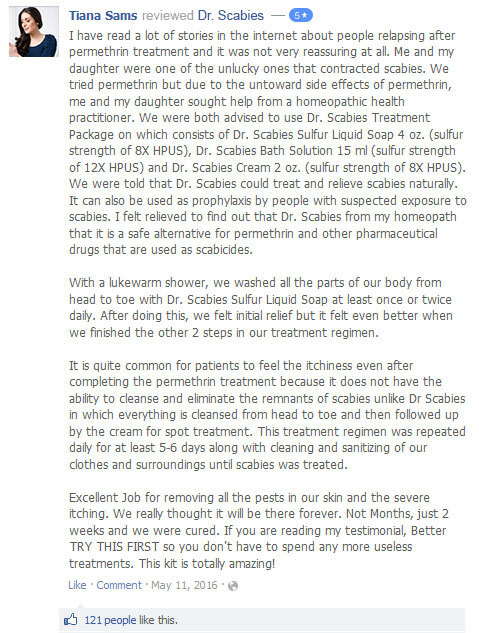 I knew I was exposed to scabies so I asked for prescription for permethrin from one of our resident doctors. More than two months passed, there was no itching, no rash or anything until 2 weeks ago. So many bumps appeared on my skin each day. It started on my interdigit web spaces and spread to my whole arms. I have to take a leave from work so I won’t transmit the disease further. Being a healthcare provider, it was so frustrating to contract the disease myself. I looked up on the internet for more effective and natural treatments available. I know the nature of permethrin so I want to avoid it as much as possible. 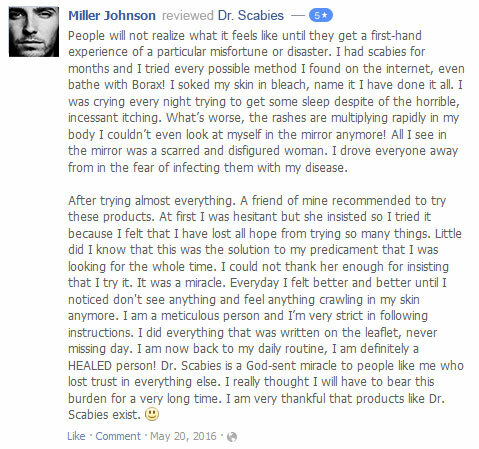 There’s this product called Dr. Scabies and it was mentioned in a number of forums, it seems to have great feedback from the people who used it. I bought one for myself, followed instructions to use it. I also got rid some of my furniture, cleaned the house with borax, sealed up my used clothes, I did everything I could possibly do to contain the spread of scabies. It’s a good thing I live alone. The redness, itching and inflammation of my rash died down after 5 days. I knew from that point I was cured but it took several more days to completely dry the lesions. I think, no one understands scabies, like Dr. Scabies. I made the right choice. ** These statements or testimonials are not claimed to represent typical results. Individual outcomes may vary, and are not intended to represent or guarantee that anyone will achieve the same or similar results. Every person has unique experiences and circumstances, these statements are meant to highlight of what the best, most motivated and consistent Dr. Scabies users have achieved.